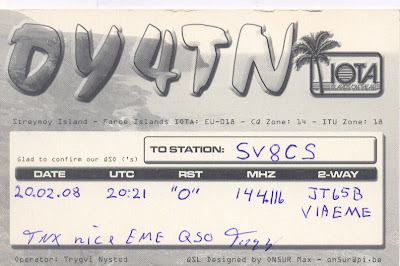 Yesterday received the qsl card from Trygvi, OY4TN for our 2m EME QSO. 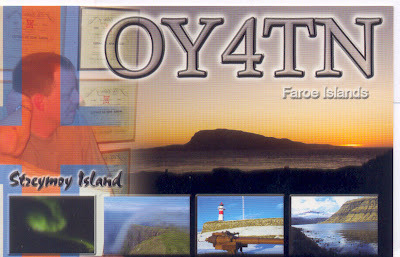 OY4TN (Faroe Island) is a new one for me also. We had QSO at 22 Feb 2008 in JT65b mode and seems to be the 1st between OY land and SV. Trygvi had a 8 elements antenna and 300w by TE Systems linear amplifier. Of course Trygvi had upload also his log to the LoTW (ARRL). Thank you very much Trygvi for your patience to complete the qso and give to me another new one on 2m EME.